Despite the cold at the moment it's still plum season and as result I've inadvertently ended up with a huge bucket of them. Initially they went into my mouth, then this cake, and finally into jam as a way of keeping them around for longer. Despite how nice they were, there's only so many plums two people can eat in a week. I would write about the jam but it's quite a simple process and cake is much more fun. This cake served as a good way to turn the plums into something different once you've reached the point of having eaten too many on their own. Originally an olive oil, lemon, and cherry cake I decided to add my own twist on it. 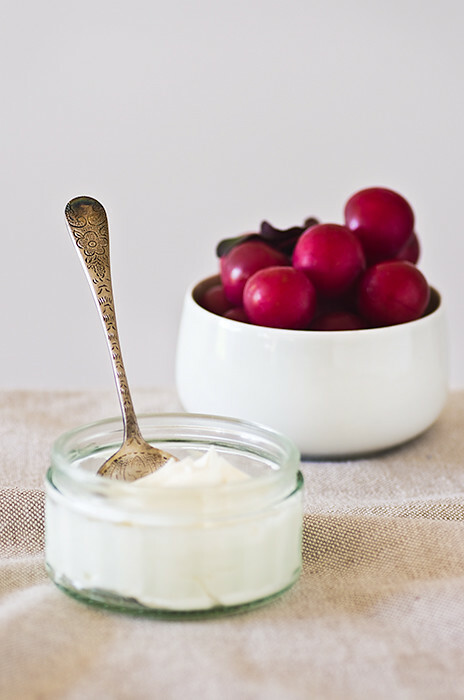 Out with the olive oil and cherries, in with the macadamia oil and plums. The plums definitely take a back seat to the lemon, as the cake is extremely lemony making it a simultaneously sweet and tart experience. Macadamia oil isn't strictly necessary as I'm not sure how easy to find it is outside of Australia, and in all honesty the only reason I used it was because I couldn't find walnut oil at my local shops. I'm sure you could even use a mild olive oil as the recipe intended. I didn't as I'm not sold on olive oil in cakes. Center a rack in the oven and preheat the oven to 180°C (350°F). Butter a 25cm (10") round springform pan, dust the inside with flour and tap out the excess. Sift the flour and baking powder together,set aside. Place the sugar and chopped lemon zest in the bowl of an electric mixer. Rub the ingredients together between your fingers until the sugar is moist and aromatic. Fit the bowl to the mixer with the whisk attachment in place. Add the eggs and beat on medium-high speed until the mixture is pale and thick, about 3 minutes. Set the mixture to its lowest speed and beat in the milk. Add the sifted dry ingredients, beating only until they are incorporated, then add the lemon juice, warm melted butter and macadamia oil. Beat until the ingredients are just blended. Pour about 1/3 of the batter into the prepared pan. Top with enough plums to cover the batter, the pour the rest over the top. Smooth the batter with a spatula. Bake the cake for 30-35 minutes, or until it is golden and pulls away from the sides of the pan. Remove the cake from the oven and immediately unmold it. Invert the cake so that it is the right way up and allow to cool to room temperature. Once cooled, dust with icing sugar and serve with mascarpone. I would love to have excessive plums, really :) The colors look so delicately beautiful! This looks so light and airy (and very moist too). I love the fruity flavor of plum in a dessert. I really like this recipe! How gorgeous! This looks amazing and I just adore your photography. Every week we go and get at least a pound of plums from the market and even before I can think of turning them into cakes, they disappear! I might have to keep a few aside to make this one pretty soon. The cake looks super pretty! gorgeous, can't wait to try it. I love the light in your photographs. The cake looks delicious! 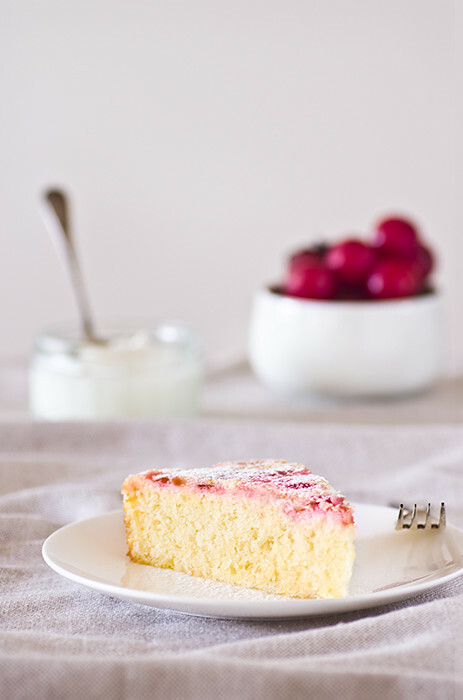 I love the idea of mixing lemons and plums in cake form - perfect twist on the recipe!